Effective and reliable power quality solution for heavy industries and electrical utilities. Are you searching for a solution to improve the productivity, capacity and reliability of your plant? Voltage instability, flicker and harmonic distortions are commonly experienced power quality challenges. Poor power quality can undermine the productivity, capacity and reliability of industrial plants with challenging loads such as electric arc furnaces. Power quality problems also impact the stability and transmission capacity of the supply network. Merus Power Static Var Compensator is an effective and reliable power quality solution – an investment that pays off quickly. Fast and effective response to voltagevariations, flicker and harmonic distortions bring proven benefits to both heavy industrial plants and supply network. Merus SVC releases the undermined capacity while improving productivity and reliability in your plant at the same time. Supply network and neighboring facilities enjoy greater voltage stabilization and enhanced transmission capacity. The Static Var Compensator’s state-of-the-art high voltage thyristor valve, reliable controller, modern user interface and redundant technical design are combined into a fast, reliable and robust system that is easy to operate and complies with all standard communication protocols. 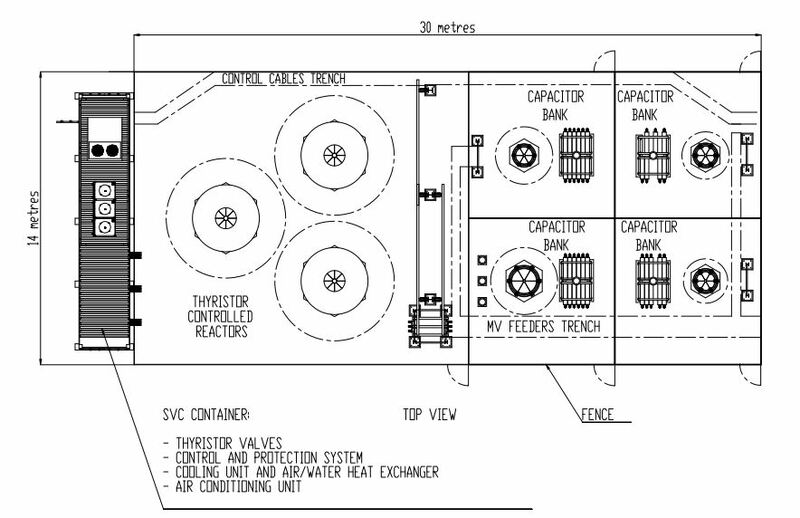 The Static Var Compensator is connected parallel with the load to be compensated. The system provides reactive pow er in proportion to the system supply voltage. In the heart of the system is Merus thyristor valve that is developed to meet the demands of performance and reli ability in harsh industrial environment. Due to its mechanical composite construction, the size of the valve is compact and it can be installed even in a standard sea freight container. The electronics are simple and robust, but the device is still equipped with comprehensive monitoring and electrical protection features. 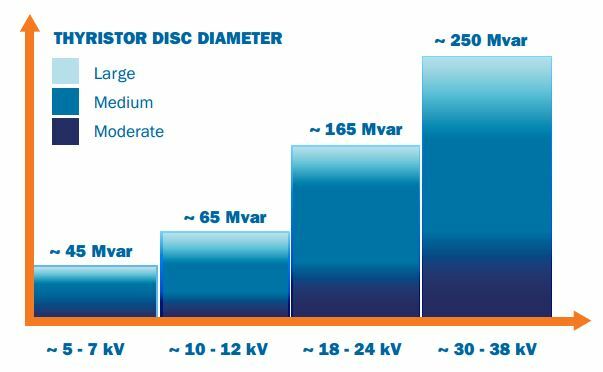 All communication between high voltage thyristor disc level and ground control system is utilizing fibre optics which makes long distance signal transfer possible. Thyristor-controlled reactors (TCR) generate SVC’s inductive power and passive filter capacitor banks generate its capacitive power. As TCR also generates harmonic currents, the capacitor banks are fine tuned for not only reducing harmonics generated by the load but also from the system itself. The thyristors are net commutated thus they can be turned on once per cycle. 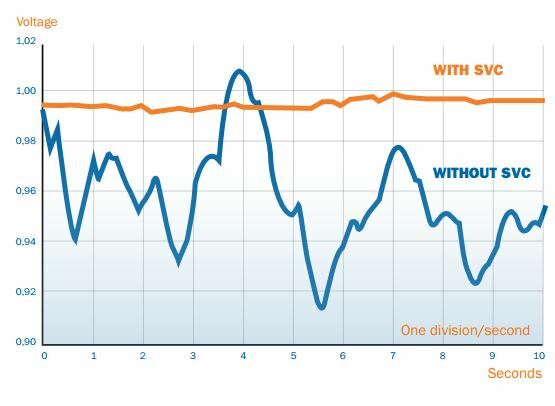 This feature along with the control and measuring strategy define response time for reactive power and voltage changes. When open loop control strategy is implemented, the typical response time of the SVC system is 10ms (50Hz). Merus control & protection system guarantees superior performance for flicker mitigation, reactive power control, power factor control and voltage stabilization. Advanced protection system ensures that the components are well pro tected against unexpected system fault conditions. Master controller regulates the operation of thyristor valve in order to respond to the system’s reactive power requirements. Due to compact valve design a system can be built in a standard container and is easily re-locatable. Merus Power is an ISO 9001:2008 certified company. The commercial and technical chal lenges of Merus Power’s customers are fully understood as the company’s experts have decades of experience in steel, mining and other demanding industrial applications. Our experienced project team takes care of the whole project right from the initial phase including onsite delivery to installation, commissioning and training of personnel. Furthermore, our aftersales services ensure smooth opera tion of the system and maximize the return on investments. The system can be built for all medium voltage levels starting from 3.3kV all the way up to 38.5kV. The power output range starts from 4Mvar up to 250Mvar and the systems can be connected parallel for a higher total output. CHOOSING BETWEEN MERUS SVC AND MERUS STATCOM? To achieve superior flicker reduction on weaker grids, Merus STATCOM could be alternative solution for your specific application. Working as a Voltage Source Converter (VSC) Merus STATCOM is built on latest power electronics technology. By providing short-term over loading capabilities, Merus STATCOM could be the right solution when superior flicker reduction is the goal. Our experts will be happy to discuss the best solution for your specific challenges. 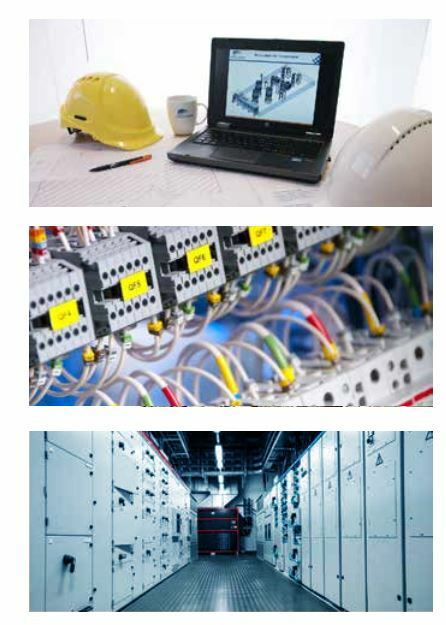 our solutions save energy, increase productivity and lifetime of the facility. We also offer a service portfolio which spans the whole product lifecycle from power quality surveys to after sales services. We provide our clients with world-class products, reliable Finnish technology, dependable and flxible service and true co-operation. Merus Power is a member of Cleantech Finland.